Through the years, our Mutt-i-grees Student Ambassadors have made lasting impacts on the lives of shelter animals and the members of their community by making it their mission to empower fellow students to cultivate empathy and achieve awareness. Student Ambassadors are nominated by faculty or others at Mutt-i-grees schools. Rosie Ferrell is the exception: She brought the Mutt-i-grees Curriculum to her school, Cascia Hall Preparatory School. Having not previously used the Mutt-i-grees Curriculum, Rosie saw the necessity to incorporate a social and emotional learning facet into her Tulsa, Oklahoma prep school. With unwavering support from students and faculty alike, the school felt that the Mutt-i-grees Curriculum could make its home amongst the members of the school’s Dog Club that provides students with the opportunity to volunteer at the Tulsa Humane Society. We admired Rosie’s immense passion for helping animals and knew that she would make an excellent leader in getting other students involved in animal welfare. Rosie, having already been a volunteer at the humane society, strengthened the relationship between school and shelter by opening the door to new opportunities to find homeless dogs and cats safe and loving homes. Growing up with rescue animals and exposure to a shelter environment enables one to appreciate the hard work that goes into caring for these pets, and Rosie felt that every student in her school should get an opportunity to experience this. Thanks to tremendous support from her teachers and mentors, Rosie was able to increase student volunteering and fundraiser involvement in her school in a matter of months. 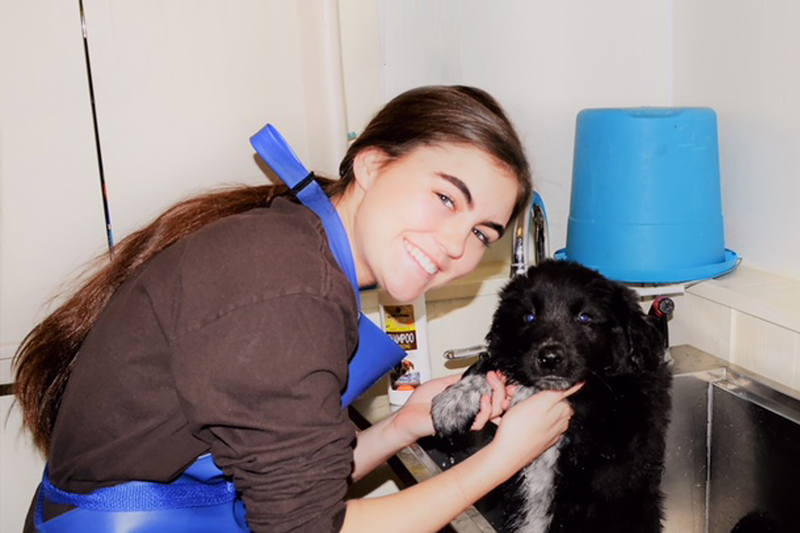 Every weekend, Rosie and a group of fellow students from the Dog Club visit the local shelter to walk dogs, clean cages and bathe animals so they look their best for their future families. January is Cascia Hall’s mini-mester month, where students gain the opportunity to take additional electives and build upon new skills pertaining to their unique interests. One such class called For the Love of Dogs offers students a lesson on how animals affect human lives in positive ways, as well as tips on how students can practice building empathy for others and become more aware of issues in their community. Freshmen and sophomores take these classes, while juniors and seniors are encouraged to participate in internships during the month in order to build real-world skills that will transfer well to their future careers. With the full support of her teachers and peers, Rosie has a lot planned for her service learning in 2018. To alleviate stress around testing time, Rosie would like to host an event where students can take selfies with shelter dogs in order to promote them on social media to potential adopters. Constantly on the lookout for what necessities her local shelter needs, Rosie will update her students on what they can donate to the dogs and cats to aid them in the changing seasons and bring comfort as they await their forever homes. We have no doubt that the rescue pets of Tulsa are in good hands with the Dog Club of Cascia Hall looking out for them. When we pick our Mutt-i-grees Student Ambassadors, one of the many traits we look for is the drive to motivate others to carry on the mission of educating people about the plight of shelter pets, and how we can make a difference in their lives while improving the lives of others around us. Rosie Ferrell has done a remarkable job, not only in introducing a new school to the Mutt-i-grees Curriculum, but working to shape her community into one she is proud of. We can’t wait to see what Rosie has in store for the many Mutt-i-grees in need, and how she will continue to grow into a responsible and caring citizen in the years to come.